When Mormon settlers reached the awe-inspiring canyons around the fertile Virgin River in Southern Utah, they declared their search for a new homeland complete. 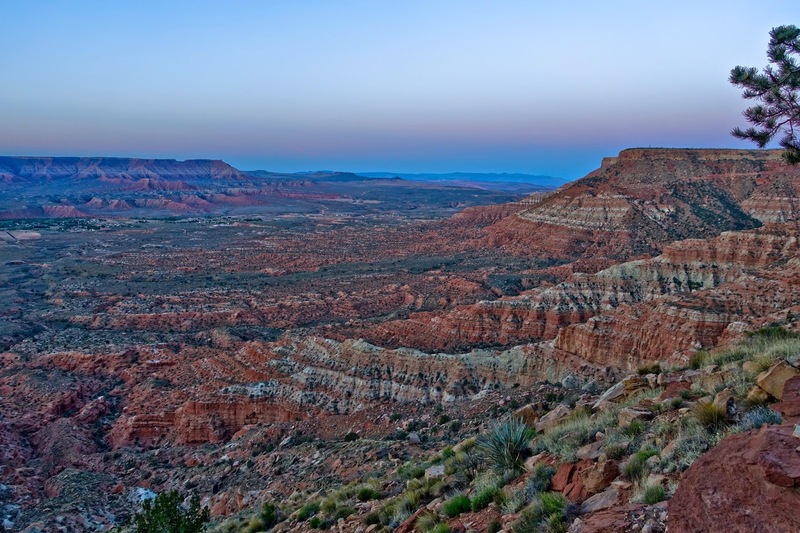 According to “Utah: A Guide to the State”, Native Americans living in the area avoided the dark canyons, and thus the valley offered a sanctuary for the settlers. Drawing analogies from another wandering people in biblical times, they named the canyons surrounded by towering red rock formations, Little Zion. According to Wikipedia, the word Zion first appeared in the Book of Samuel, dating from the 6th century BCE. It commonly refers to the geographic area of Jerusalem, but also to "the World to Come", the Jewish understanding of the hereafter. Others have adopted Zion as a metaphor, symbolizing a longing by wandering peoples for a safe homeland. And for some, it has taken on a more spiritual meaning—a peace of mind in one's present life. 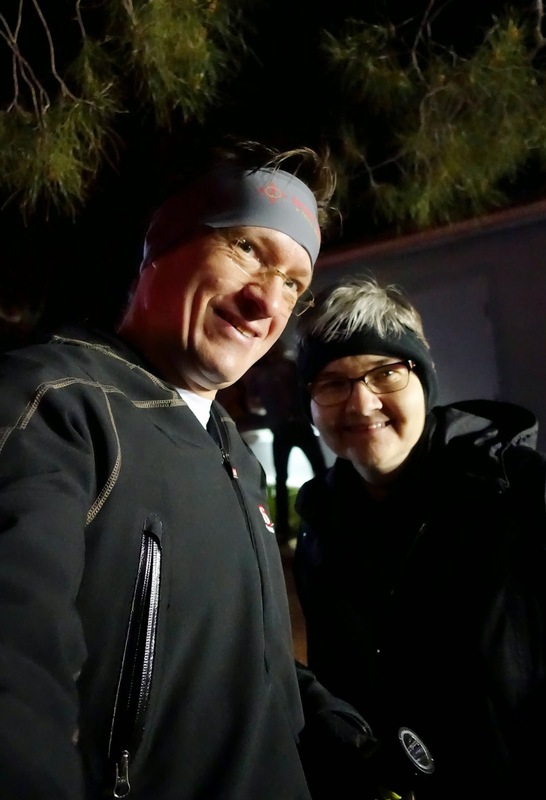 On April 9, Gudrun and I headed to Zion Canyon where I joined a few hundred other intrepid souls who had signed up for the Zion 100, for their own wandering journey in this the area. 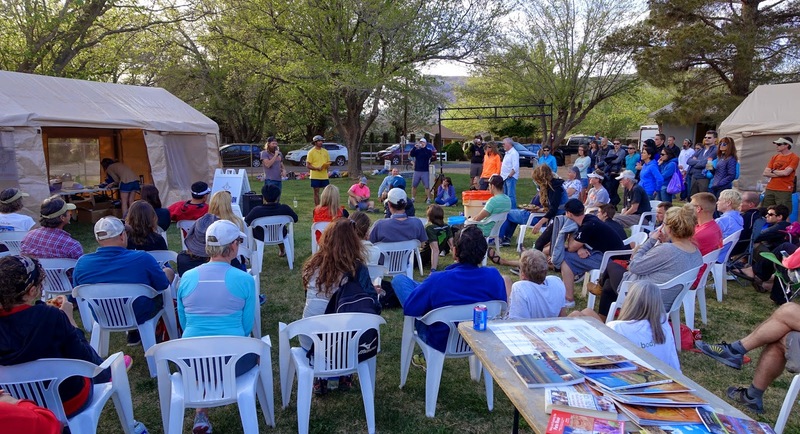 The Zion 100 is an ultra-marathon footrace through the surrounding desert, up and over slick-rock covered mesas, until, many long hours later, it ends back at the start in the small village of Virgin, Utah. As always, the reasons for participating in these kinds of adventures are as diverse as the participants themselves. For some it is simply an opportunity to run in beautiful places, to do what they love to do. For others it is an opportunity to challenge themselves, to test their physical and mental endurance. And for some it may indeed be something more akin to a personal quest for meaning, an expression of their own longing, even perhaps, their own search for Zion. These thoughts were on my mind as I headed out on the course at six o’clock in the morning. 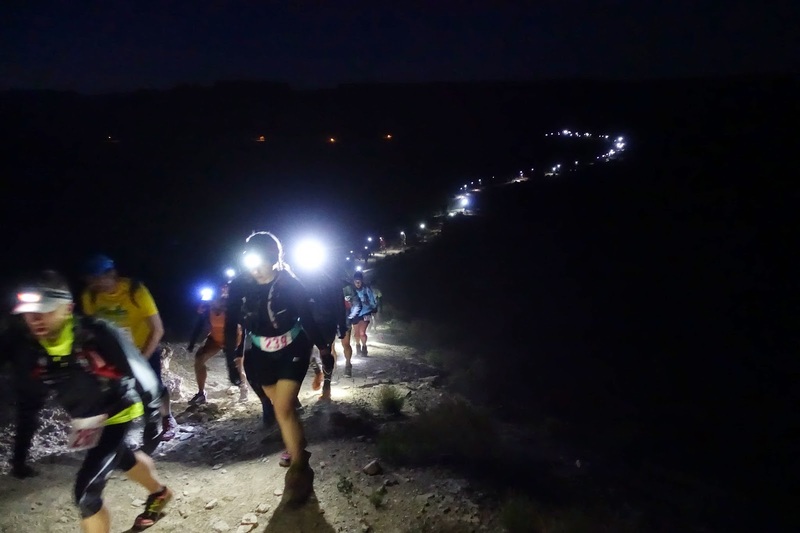 It was pitch black as I trekked along amidst a long line of runners following a soft and sandy double-track trail illuminated by a string of headlamps. 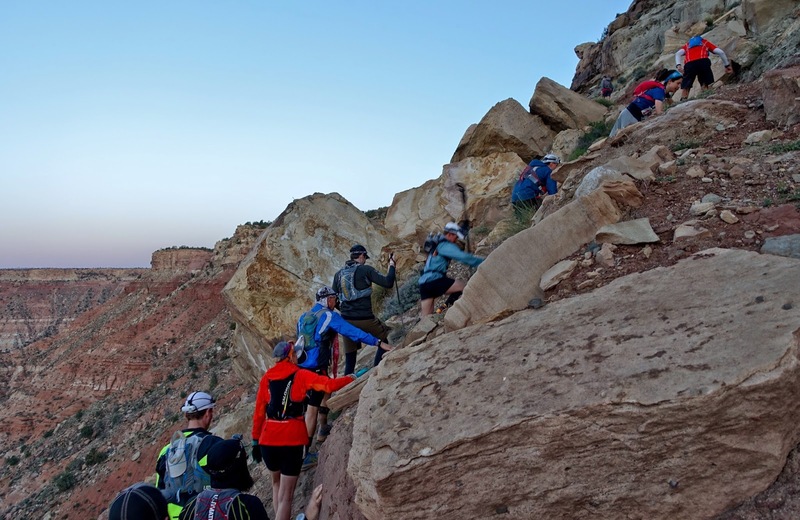 A few miles into the course, the terrain became hilly and the trail began to climb towards our first destination: Flying Monkey Mesa. Mesa is the Spanish word for table and so my mind conjured an image of a table surrounded by Flying Monkeys. But that did not make a lot of sense. Why wouldn’t the monkeys sit at the table? What were flying monkeys anyway? And what were they doing in the desert? As far as I was aware, there were no monkeys in Southern Utah to begin with, let alone flying ones. The mesa part of the story was easy enough to figure out. 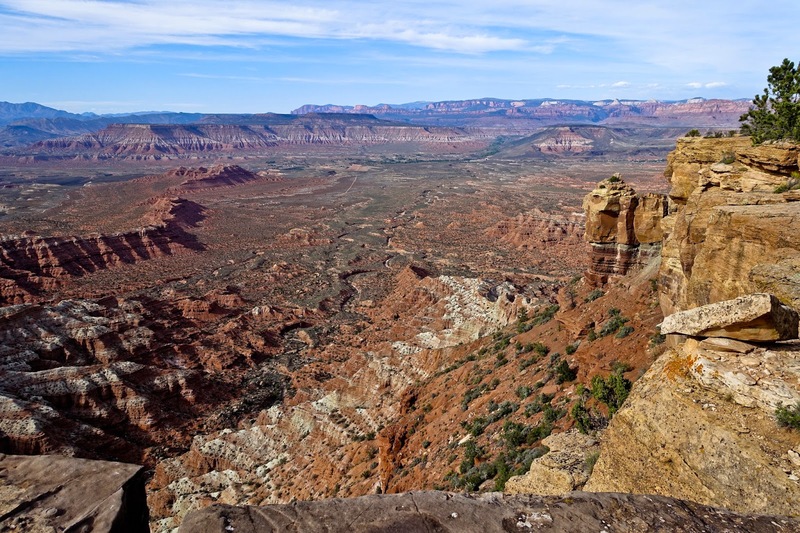 Of course the word mesa is the common American term for tableland, an elevated area of land with a flat top and steep cliffs. 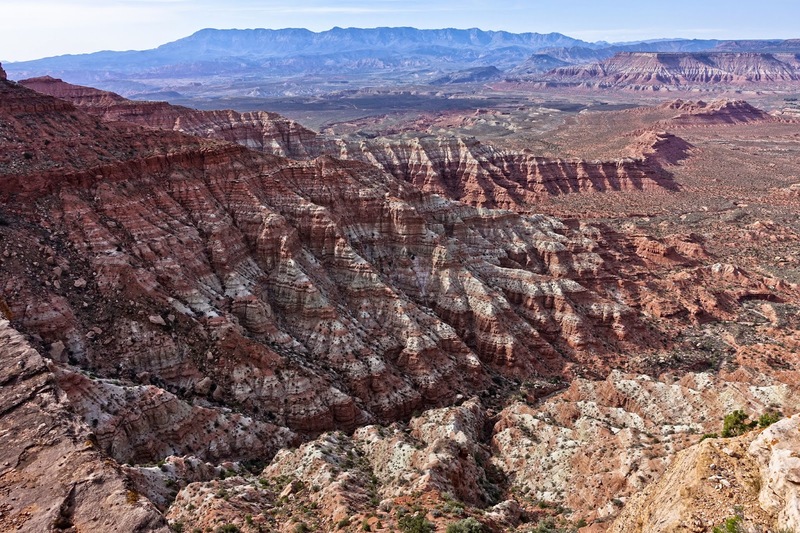 Mesas form by erosion of horizontally layered rocks that have been uplifted by tectonic activity. 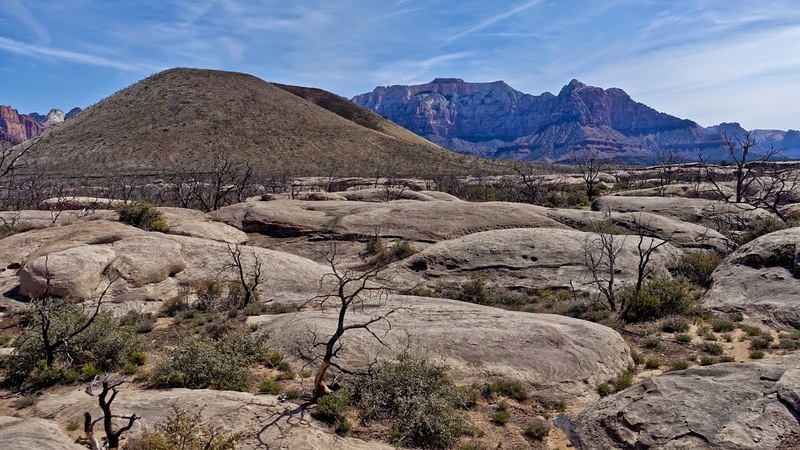 The weaker types of rocks are eroded away over time, leaving the more resistant types of rocks topographically higher than their surroundings. 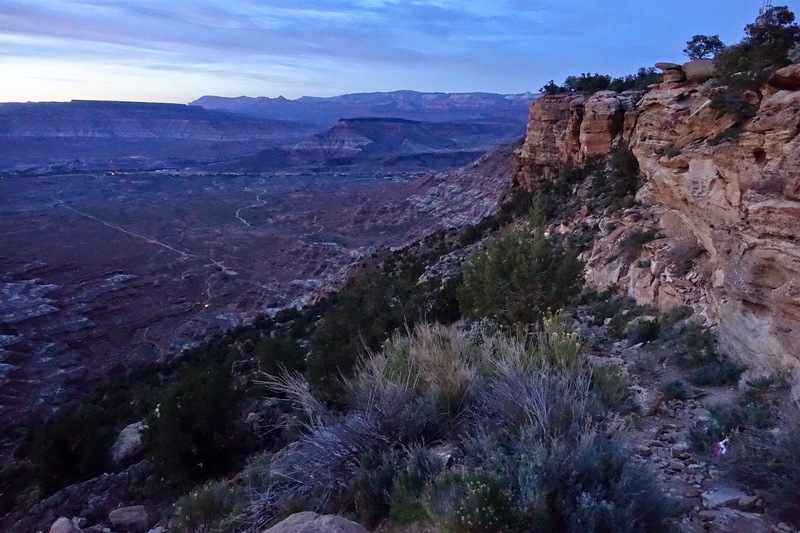 Gradually, dawn broke as we were conquering the cliffs offering the first great views over the Virgin River Valley. And yes, the cliffs were steep. The first rays of the sun hit the valley as I got close to the top of the first mesa of the day. At the top, the course had us running around the mesa in a big 6-mile circle. It dawned on me that perhaps we were the monkeys. Although, after all the climbing, I can hardly say we were flying. The trail was glowing in the soft morning light. Wherever the monkeys were, I’m sure they enjoyed the views. The forest atop the mesa did look like it could provide a good habitat for monkeys. OK, so I photo-shopped the monkey into this picture. But I did research the real story after the race. First, here’s an aerial image of Flying Monkey Mesa, also known as Hurricane Mesa, that you can readily find on Google Earth. Do you see what I see? There are the remnants of a very long airport runway, right atop the mesa. Before this was a runway, it was a 12,000 foot long rail track that ended right at the edge of the mesa. OK, so why would anyone build a straight rail track from one edge of the mesa to the other? 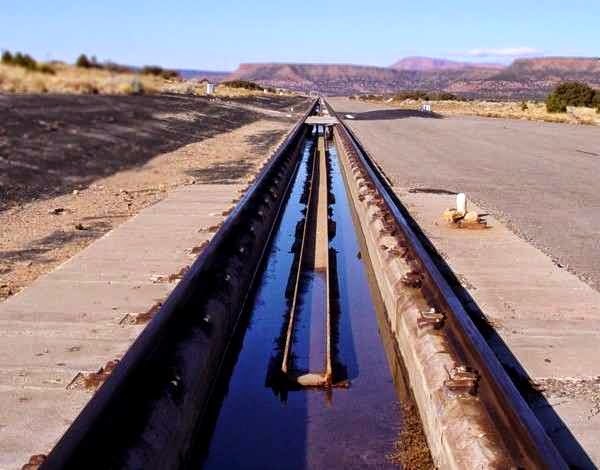 Built in 1954, this rail track became the longest rocket research track in the United States. It was used to test sophisticated cockpit escape systems that would allow a pilot to safely exit from a supersonic fighter jet in case of an emergency. According to the web site titled “Abandoned & Little-Known Airfields: Southwestern Utah” the remote location atop Hurricane Mesa was ideal. 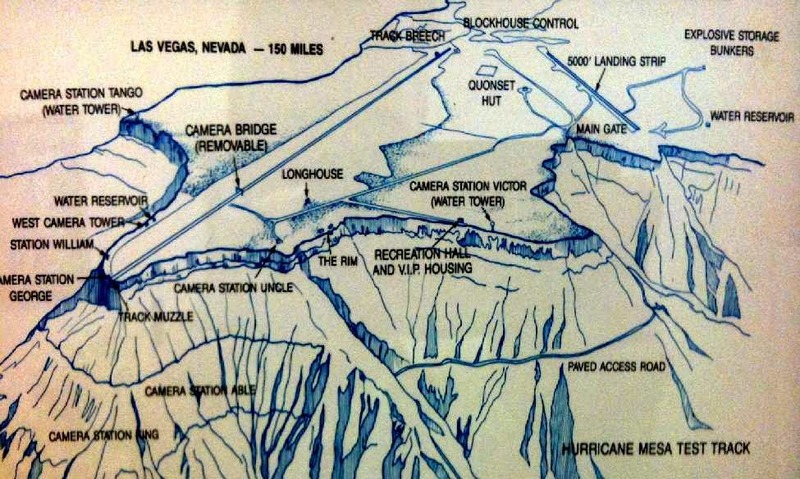 The mild climate allowed for year-long testing, the mesa's flat bedrock provided a secure anchor for the track, its 1,500' drop into the Virgin River Valley was perfect for the planned tests (in which test items would be propelled off the edge of the mesa), and the Virgin River supplied all the necessary water. 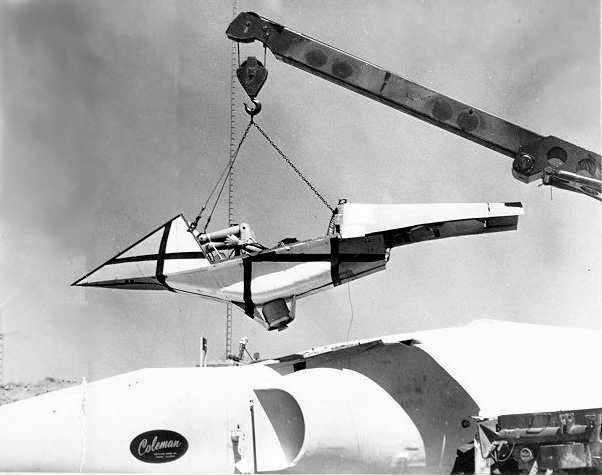 Testing typically involved hurling a rocket sled, carrying a seat with a dummy known as "Hurricane Sam" strapped to it, along the track at a speed of 1,050 mph (Mach 1.3). "Sam" was a highly instrumented anthropoid simulator with electronic equipment & a radio connected to it. Just before reaching the edge of the cliff the ejection mechanism fired, flinging the dummy over the precipice where its parachute opened and it floated to the valley floor. And, indeed, in one series of tests "Hurricane Sam" was replaced by apes to determine the effects of ejection on living beings. So the people down in the river valley would occasionally hear a loud engine roar followed by the sight of a monkey strapped to a parachute soaring down from the mesa into the valley. So there it is. Mystery explained. Having completed the loop around the mesa, without seeing any monkeys, flying or not, it was time to descent back into the valley. 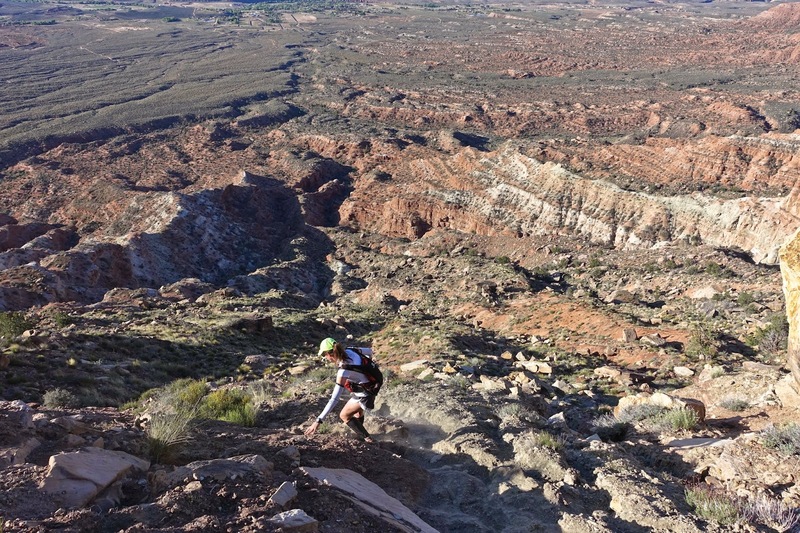 Descent from Flying Monkey Mesa. The village of Virgin is in the background. Did I mention the cliffs were steep? Loose rocks and sand added some challenges. After a few miles along the valley floor, and after crossing a creek that actually had water in it, I began to climb anew, this time to the top of Guacamole Mesa. I’m not sure how this mesa got its name but I was thinking less of soft guacamole and more about the hard avocado pits when the trail went across this undulating surface of rock upon rock upon rock. This went on for about 8 miles and took a lot of energy. 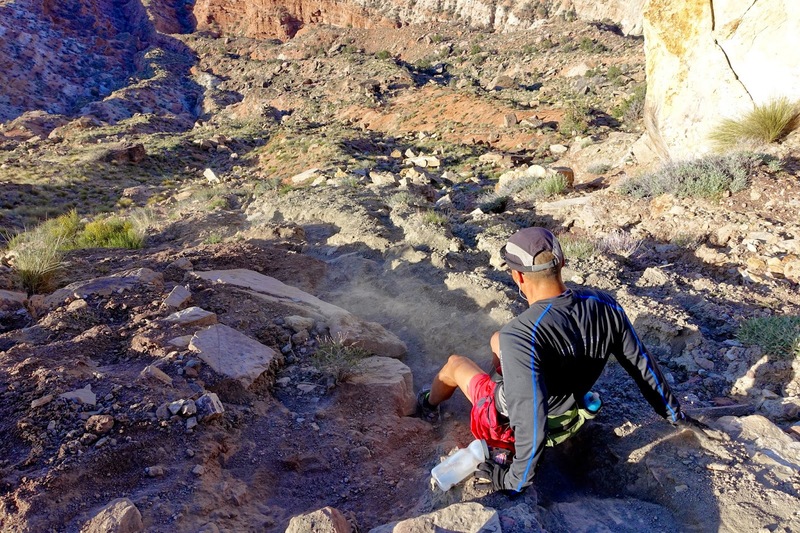 The descent was along a reasonably graded dirt road and offered some of the faster miles of the race before reaching the halfway point of the 100k distance at the Dalton Wash aid station. Gudrun helped me fix my blisters and change into new socks, and off I was again. The next section had us crossing the entire valley floor and then ascending the steepest trail of the race to the top of Gooseberry Mesa. Views across the Virgin River Valley. Flying Monkey Mesa is in the distance on the right. Sweeping vistas (and Gudrun, who had had her own adventure driving a rented Subaru Outback over badly washed-out fire roads) greeted me at Goosebump Aid Station at the top of the mesa. 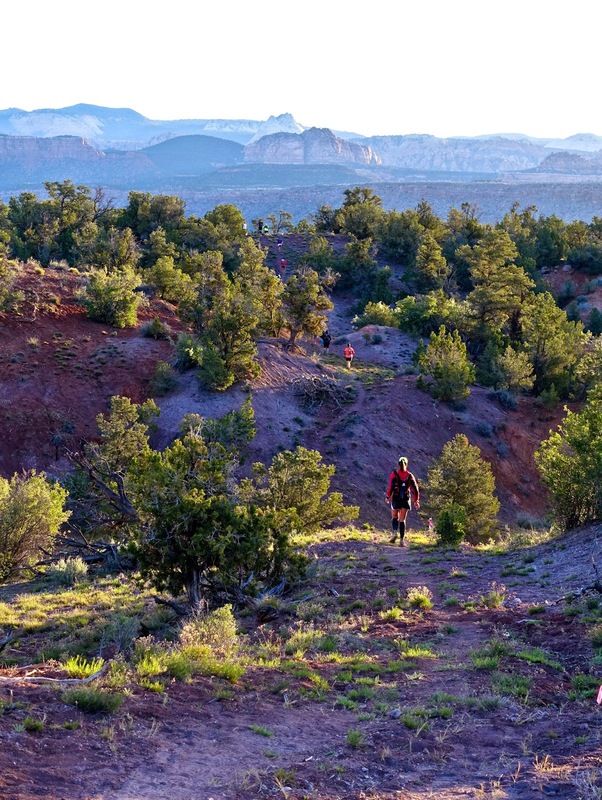 The trail then continued in a big loop around Gooseberry mesa along one of Utah’s premier mountain bike trails, alternating slick-rock and firm dirt trail among pinions and junipers. 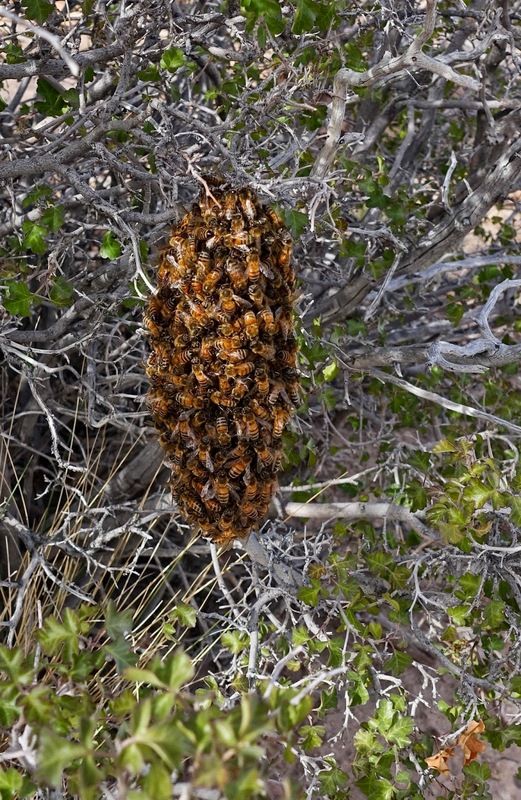 I spotted a number of rabbits that were to quick to photograph, as well as this wild hive of bees. 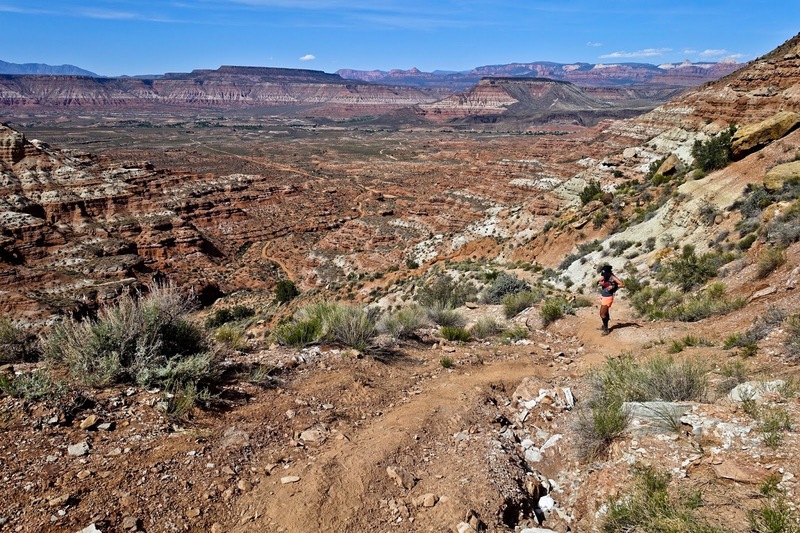 The trail ended at the super-scenic Gooseberry Point offering 360-degree views over the desert landscape of Southwestern Utah. 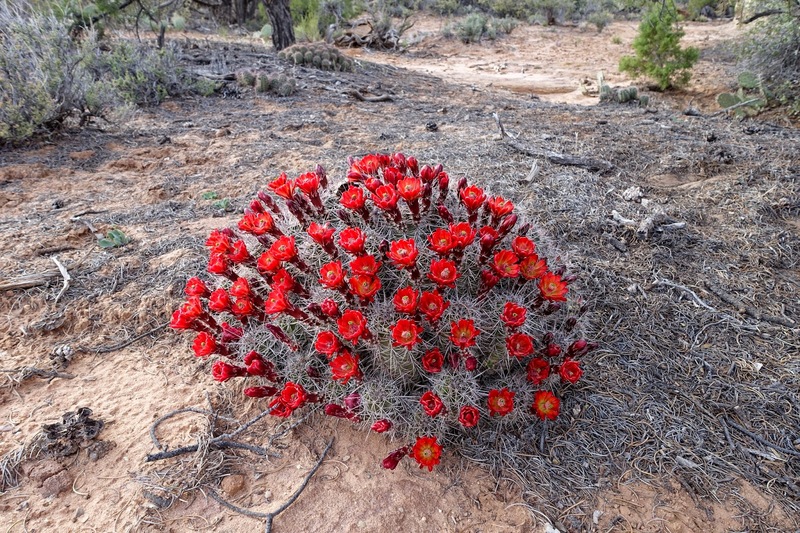 Every few hundred yards, the sight of bright red blooming cacti offered encouragement to my tiring legs. 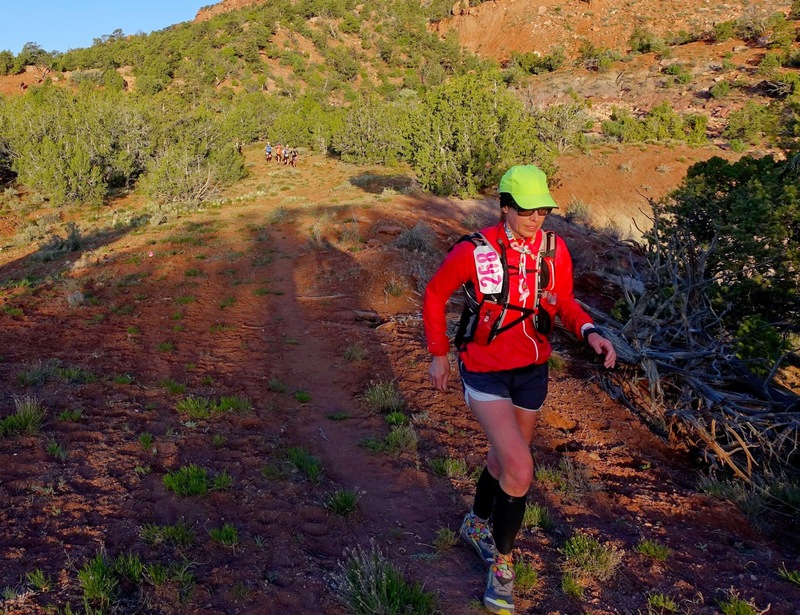 The sun set just as I finished the loop on Gooseberry Mesa, 48 miles into the race. The colors were most spectacular. 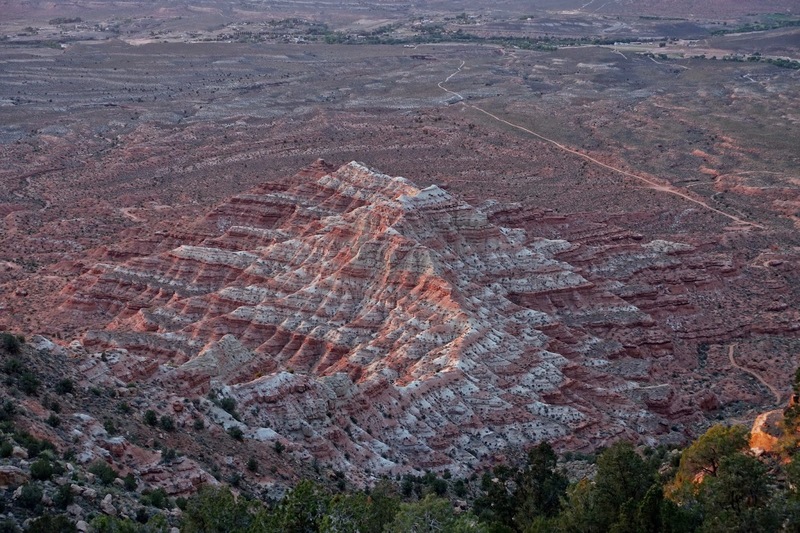 The deeply-eroded, alternating bands of red and white at the foot of Gooseberry Mesa are mudstone of the Moenkopi Formation, laid down during the Triassic Era (about 240 million years ago). 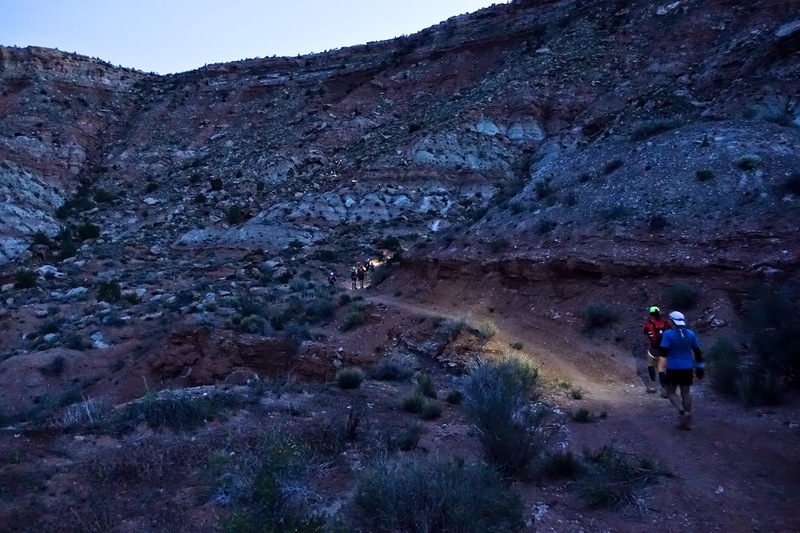 Night fell just as I began the steep descent from Gooseberry Mesa. The loose rocks and sand made for a fairly treacherous descent. The remaining 16 miles to the finish followed a mix of ATV tracks and single track and were a constant up and down over the hilly desert floor. Exhausted but proud for having prevailed, I reached the finish line in Virgin at 1:16AM on Saturday morning, 19 hours and 16 minutes after heading out on the course, and 44 minutes before the official cut-off time of 20 hours. In addition to thinking about Flying Monkeys, I had had a lot of time to reflect on my own personal reasons for participating in these kinds of adventures. For now, the answers remain elusive, but this may be just as well.